NORTHBRIDGE – Some 175 business, civic and elected leaders toured the latest innovation in work skills development Tuesday at the ribbon-cutting ceremony for the Blackstone Valley Education Hub, an advanced manufacturing training center located in the renovated Linwood Mill, 670 Linwood Ave. 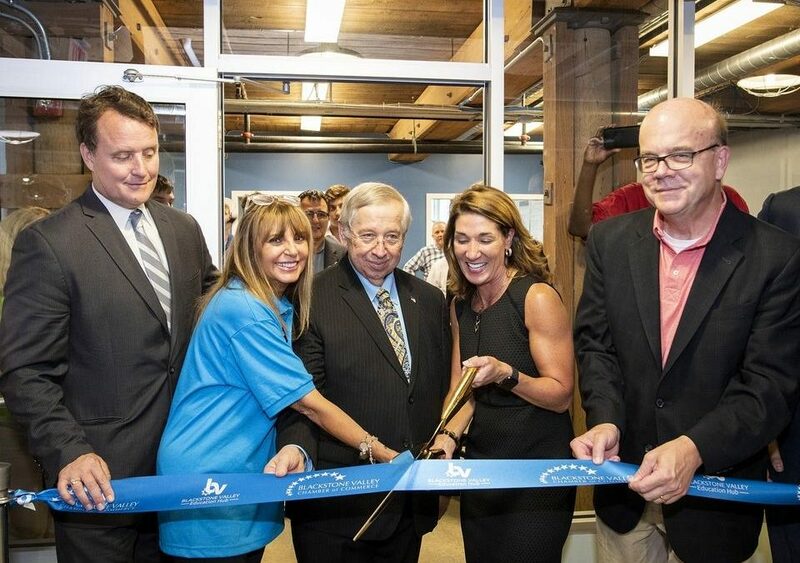 The Education Hub, part of the Blackstone Valley Chamber of Commerce’s affiliated nonprofit organization, the Center for Business and Enterprise, is a partnership among the chamber, Quinsigamond Community College, Benjamin Franklin Institute of Technology and Worcester State University. For manufacturing employers such as James Samsel, president of Wirefab Inc. in Worcester, the training young people will be able to get through the Education Hub will help fill a gap for in-demand manufacturing labor. “We have invested millions of dollars over the years in equipment, but we can’t find people to fill the tremendous vacancies,” Mr. Samsel said. “What talent that’s out there gets taken up by large corporations,” which can afford to pay higher wages than smaller, family-owned businesses. He said workers with an interest and aptitude for learning to work with computerized systems, even without a college degree, can be earning at his firm $70,000 to $80,000 a year within four years. Mr. Samsel watched admiringly as students from Grafton Job Corps demonstrated in one of the Education Hub’s labs a wire-bending machine that was an “exact replica,” but on a smaller and slower scale, of the computerized manufacturing systems on his shop floor. Wirefab makes wire products, including the baskets used in Dunkin’ Donuts stores worldwide. In another “fab lab,” or fabrication laboratory, Lt. Gov. Karyn Polito used a three-dimensional scanner to make an image of Mr. McGovern’s head, the first step in manufacturing a bobblehead figure. Uxbridge High School students Riley Tanner, a senior, and Thomas Lauze, a junior, spoke with the lieutenant governor about how they have worked at their own school and online in collaboration with students at Northbridge High School, in a computerized integrated manufacturing and innovation pathway. The students showed off LED lights with the two high schools’ symbols, which they designed and produced using CAD software and a 3D printer. Both students agreed the process was fun and an important foundation for their future work in computer science, business management or other areas. Now, other students from high school to college, to adults, will be able to have state-of-the-art training in these types of systems at the Education Hub. Mark Lyons, of AET Labs, gave a broader demonstration with the students of how 20 students at a time can work on CAD in the design classroom, and collaborate online with unlimited others, using OnShape and Stratasys software, to create new products. With the students on site demonstrating a coffee grinder they were designing, and students from Northbridge High School collaborating online, visitors saw how a product was designed and manufactured in real time. The coffee grinder blade component, which couldn’t be printed on the local 3D printer, was immediately produced from the online design at the Stratasys plant in Minnesota, and would be shipped overnight to Massachusetts. “This is exactly workforce development, the definition of it,” Ms. Polito said, pointing to the business community and schools working together. “Which means that if I’m a manufacturer, I’ll want to locate here,” Mr. McGovern said. In formal remarks before the official ribbon was cut, she said, “In classrooms, kids are now getting the skills they need …. We’re now creating this pipeline of talent. Mr. McGovern called the Education Hub an “excellent example of how targeted government investment can be a catalyst” for economic development. The Education Hub is also seen as a boon to the hundreds of high school students interested in technology and manufacturing who aren’t accepted at vocational-technical high schools. Approximately 850 to 1,000 students apply for entry to Blackstone Valley Regional Vocational Technical High School in Upton each year, but only 315 are accepted, according to Michael F. Fitzpatrick, superintendent-director. Blackstone Valley Tech students, although they aren’t the target users of the Education Hub, put their skills to use to build out the three-room complex in the lower level of the Linwood Mill. The Education Hub was designed by Uxbridge architect Gary Moyer. The chamber group received a $456,000 work skills capital grant from the state Executive Office of Education, through the Massachusetts Workforce Skills Cabinet, according to Jeannie Hebert, Blackstone Valley Chamber of Commerce president and CEO. They have been invited to apply for further grant funding. Financial support for furniture and equipment came from Quinsigamond Community College, as part of a $300,000 earmark for higher education in the Blackstone Valley, put in the state budget several years ago.